On Sunday, May 10, we’ll officially celebrate Mom, and all the beautiful ways she influences our lives. Here at Adrian’s we’ve curated a collection of gifts as unique as she is. You never know where she’ll call from next! 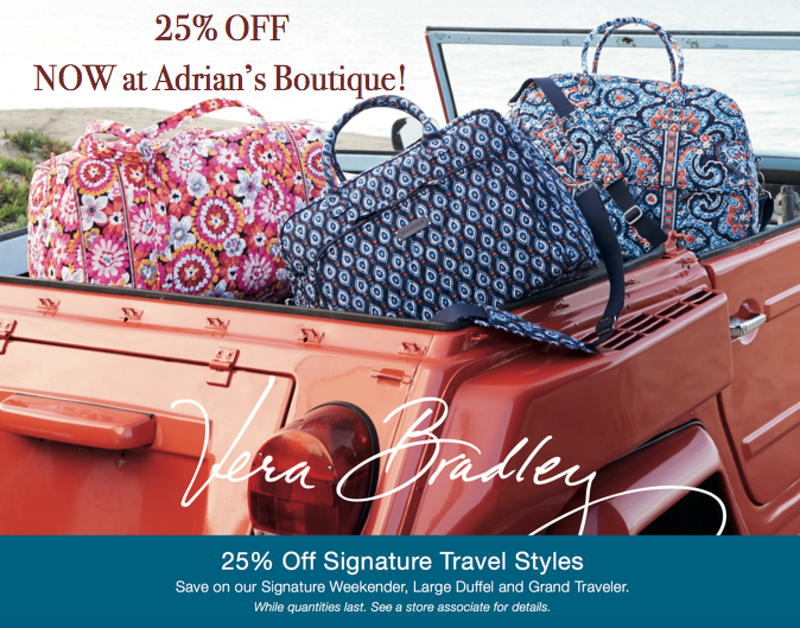 Find a perfect Vera Bradley travel bag or handbag and see where her next adventure will take her! Maybe your mom enjoys backpacking, camping, or “roughing it” at the Ritz Carlton! Whatever her style, Vera Bradley has a travel bag that will fit her needs. Many of the handbags, travel bags and accessories are machine washable, so they are easy to take care of and will last for years! You might have a daughter who is a NEW mom this Mother’s Day, and we have great baby bags, and travel items to make her new adventure a little more manageable! These make FABULOUS Mother’s Day or Graduation gifts! One of the fun places I love to visit is the beautifully restored La Posada Hotel in Winslow, Arizona. 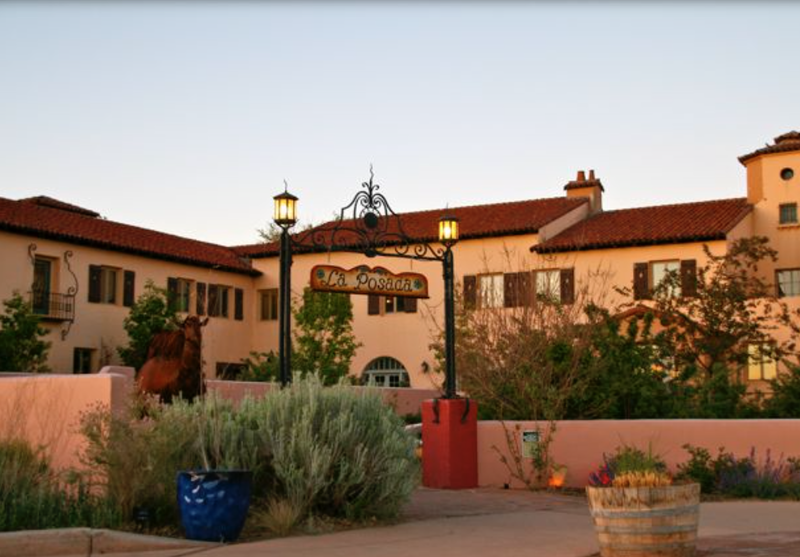 The LaPosada is the Last Great Railroad Hotel built in 1929 by the Santa Fe Railway for the Fred Harvey Company. It has an absolutely gorgeous exterior, beautiful southwest gardens and the interior features large original artwork from co-owner Tina Mion, whose work is also featured in the Smithsonian Museum. Their Turquoise Room Restaurant was rated as one of the top three restaurants in the U.S. in the 2009 Conde Naste Gold List. Their signature Black Bean and Corn Soup is a favorite of mine and we have posted the recipe HERE. Tina and her husband, Allan Affeldt have lovingly restored this old treasure to it’s former glory and it is surprisingly affordable to stay here! If you’re ever in the area, be sure to book a night or two at this Southwestern United States treasure! DaVinci Beads and Forever in My Heart Lockets, Charm Bracelets & Necklaces. If you’re looking for a personalized gift that is unique to YOUR special Mother, look no farther than this line of beautiful jewelry. 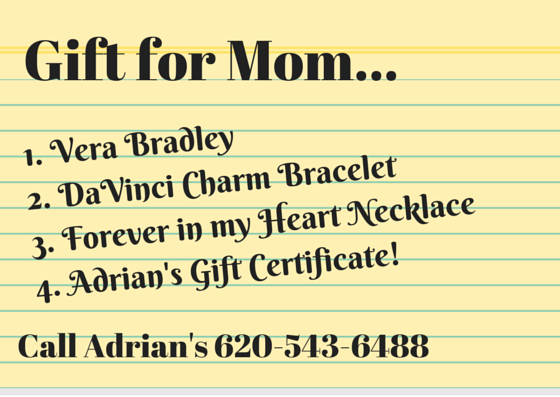 Adrian’s is fully stocked and our staff is ready to help you create the perfect jewelry to reflect your mom’s interests, family or favorite color! 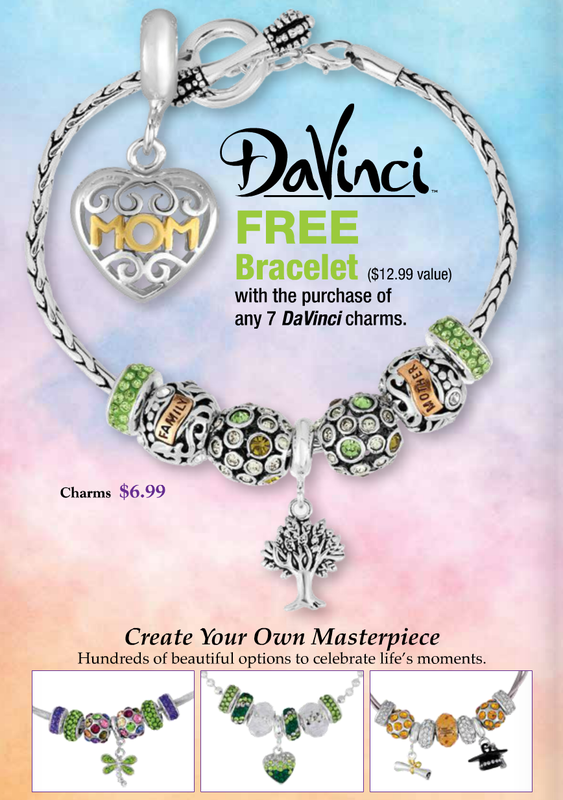 DaVinci Beads are only $6.99 each, and you’ll get a FREE bracelet ($12.99) value, when you purchase 7 beads. FREE bracelet ($16.99 value) when you purchase 7 charm drops. We will help you build a beautiful, personalized bracelet or necklace! 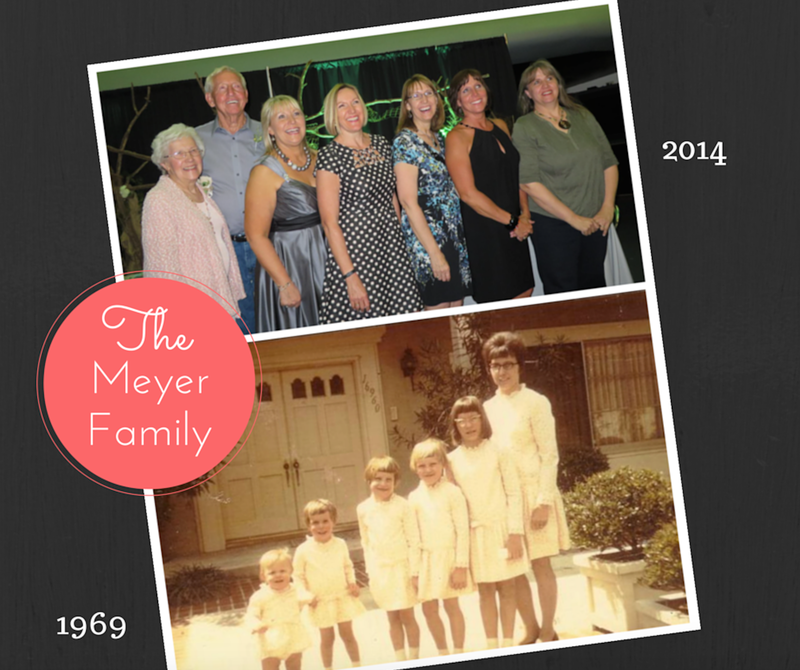 My four sisters and I are so blessed to have a wonderful mother, Ruth Novak Meyer. She has been a shining example of how to live our lives, taught us all how to work hard, to laugh and be crazy, and to feed people well! She has a deep faith that has taken our family through many times of trials and I am forever grateful for her. She has lived quite the “adventure” herself! I have posted this photo from 1969 several times through the years, but it is still one of my very favorite photos of my sisters and mother. We were quite the crew back then…5 little girls, many times, thanks to my mother’s excellent seamstress skills… all dressed alike! People always ask what “The Meyer Sisters” look like now, so have included our latest photo taken at our daughter, Jenny’s wedding last June. Remember your Mother, daughters, sisters and those “Other Mothers” that are so important in your life this week. Take the time to select something that she will love and we’ll do the rest! Complimentary Gift Wrap is an Adrian’s tradition, and we’ll have you out the door in no time! Or, make it easy and PURCHASE A GIFT CARD. We look forward to seeing you this week! Thank you for choosing to shop at Adrians and other local, independently owed business. As always, we are here to serve you, and would be long gone without you!